Which one did we see again…? When it comes to boldness, Captain Kirk beats Hollywood hands down. The Starfleet captain takes impossible risks and doesn’t believe in a no-win situation, while the studio bosses know that the best way to make money is to back sure-fire winners, and that means remakes, sequels and – if you’re lucky – the odd prequel. Why take the risk of commissioning an original screenplay when the vast majority never become box office hits. Cinemagoers have to take their share of the blame, of course. “As a dog returns to his vomit, so a fool returns to his folly,” as the Good Book tells us, and the popularity of the film franchise is simply a reflection of what we, the customers, want to see. The paradox is that we often end up going to see the latest ‘hommage’ even though we don’t really want to. We are so attached to the original that we know the latest version is never going to be as good, but we’re also so attached to the original that we can’t resist coming back for more! The film franchise works because it sticks to a successful formula, and Iron Man 3 and Star Trek Into Darkness are good examples of its power, popularity and durability. There are many ingredients in the formula, but they almost always include a popular, comic book storyline and characters, exciting special effects, an iconic soundtrack and – crucially – enough one-liners to keep us smiling in the midst of all the death and destruction. In their search for guaranteed winners, the Hollywood studios have focused particular attention on comics. Where would the blockbuster be without Superman, Spiderman or Iron Man? The advantage of such stories and characters is that they bring with them a passionate existing fan base and the opportunity to elevate the action above the everyday through super powers. However, like football fans, moviegoers prefer a fair fight, so most celluloid superheros seem destined to have their powers taken away from them for large chunks of screen time. Iron Man follows the pattern, as Tony Stark comes up against an equally ‘super’ opponent while his suits suffer various (in)convenient but predictable malfunctions, and even Captain Kirk has his beloved USS Enterprise confiscated after he disobeys the prime directive. Kirk may not have super powers, but his whole appeal is based on strength of character, leadership and determination. In a kind of echo of the famed Kobayashi Maru test at Starfleet Academy – which he only passed at the third attempt by hacking the computer program to disable the shields of the Klingon warbirds – Star Trek Into Darkness sets up multiple impossible situations from which, somehow, Kirk and his crew manage to escape unscathed, once by a miraculous, last-ditch rescue of Spock from an erupting volcano and once by a kind of ‘Scotty ex machina’ as the Chief unexpectedly pops up inside the enemy ship to disable her weapons systems. The effect of these deeds of derring-do is to elevate the actors that perform the rôles. It’s surprising how many movie stars have had their careers launched (or relaunched) by a blockbuster. Where would Harrison Ford be without Han Solo or Robert Downey Jr without Tony Stark…? Looking back at Jaws and Star Wars – the original summer blockbusters – it’s easy to be disappointed by the special effects (unless you opt for a digitally remastered print). Whether or not it’s true that someone’s sneaker was used as an imperial spaceship, any kind of suspension of disbelief is almost impossible for a modern audience that has come to expect multi-million dollar FX and CGI graphics. The costumes, the monsters, the explosions – every aspect of a modern blockbuster has been refined to guarantee the maximum bang for the studio’s buck. Star Trek Into Darkness follows the template set by Star Wars in terms of the number of shots of spaceships, and the number of suspiciously humanoid aliens amongst the crew of the Enterprise recalls the famous scene with Ben Kenobi and Luke Skywalker searching for Han Solo in the cantina on Tatooine. The scene when the admiral’s flagship crashes into Starfleet headquarters was particularly impressive. The dust cloud looked rather reminiscent of something that happened in the vicinity of the World Trade Centre on 9/11, but maybe I’m just imagining that! John Williams did more than most to establish the blockbuster as a guaranteed money-spinner. His soundtracks for Jaws, the Star Wars trilogy, Superman, ET and the Indiana Jones and Harry Potter films (and others) have cemented not only his place in the pantheon but the popularity and greatness of the films themselves. Iron Man doesn’t have a strong musical theme, but there is a great moment at the end of Star Trek Into Darkness that proves the value of having one when Spock and Kirk are discussing where to go on their five-year mission. Spock defers to Kirk’s ‘good judgment’, and then the Star Trek theme starts up powerfully in the background. Gripping stuff! From ‘We’re going to need a bigger boat’ to the one-liners of James Bond and John McClane, blockbusters have always relied on humour to defuse tension and allow each dramatic climax to build higher and higher. The banter between Tony Stark and his robots was sadly missing from Iron Man 3, but Star Trek Into Darkness had its fair share of amusing moments, mostly arising from the usual jokes about Spock’s inability to feel human emotion, but the director could show a little subtlety, too – I particularly liked Captain Kirk’s scar in the shape of the Starfleet logo…! 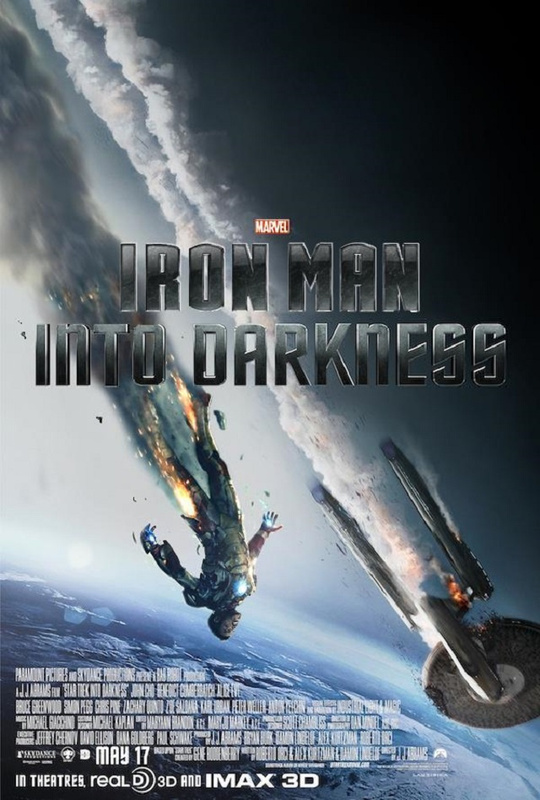 This entry was posted in Film and tagged film, film review, Iron Man, Iron Man 3, movie review, movies, Star Trek, Star Trek Into Darkness on May 14, 2013 by Nick Dale.